The guy in the video is way better at this than I am, I do the best I can, but my knife just isn’t the same kind of quality. Eventually I’ll have a nice chef’s knife that isn’t bendy and is nice and sharp, but until then – I make do. 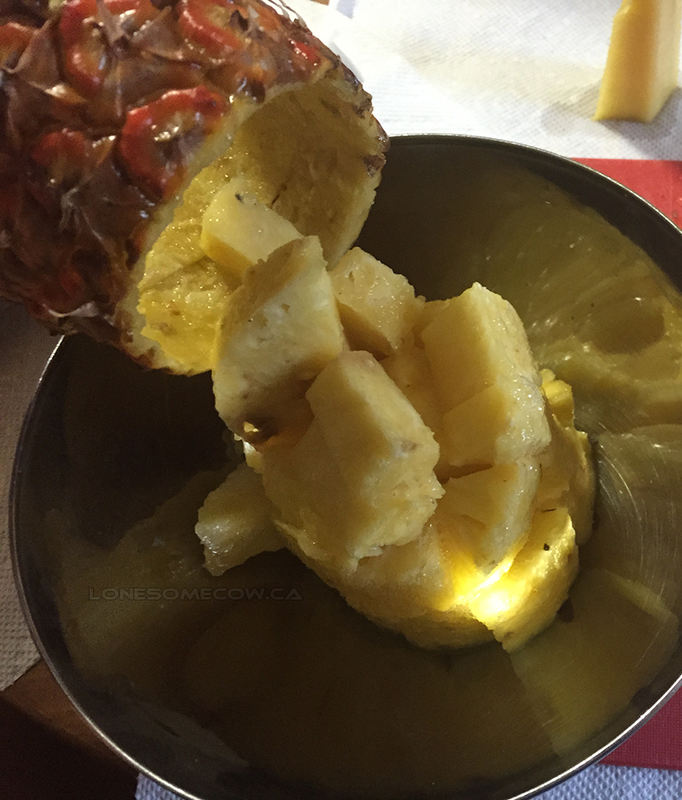 Step 1 – Cut off the top and bottom of the pineapple. Try to cut straighter than me. 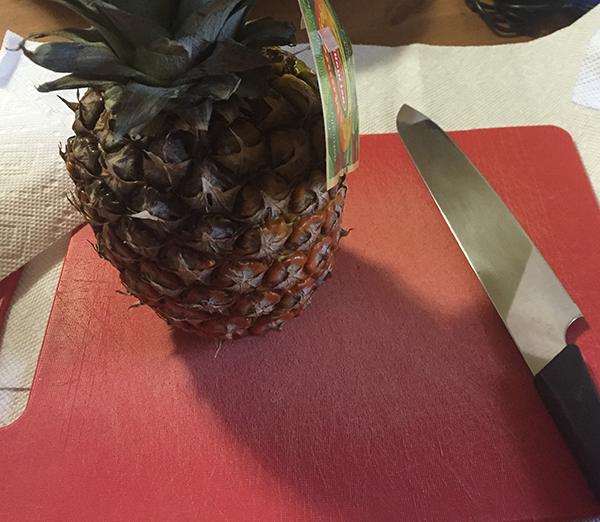 Step 2 – Insert your knife straight down next to the peel of the pineapple. Cut all the way around to separate the skin from the meat. Now my only option is this giant knife. If you can, try not to cut all the way through, it makes the next part easier. 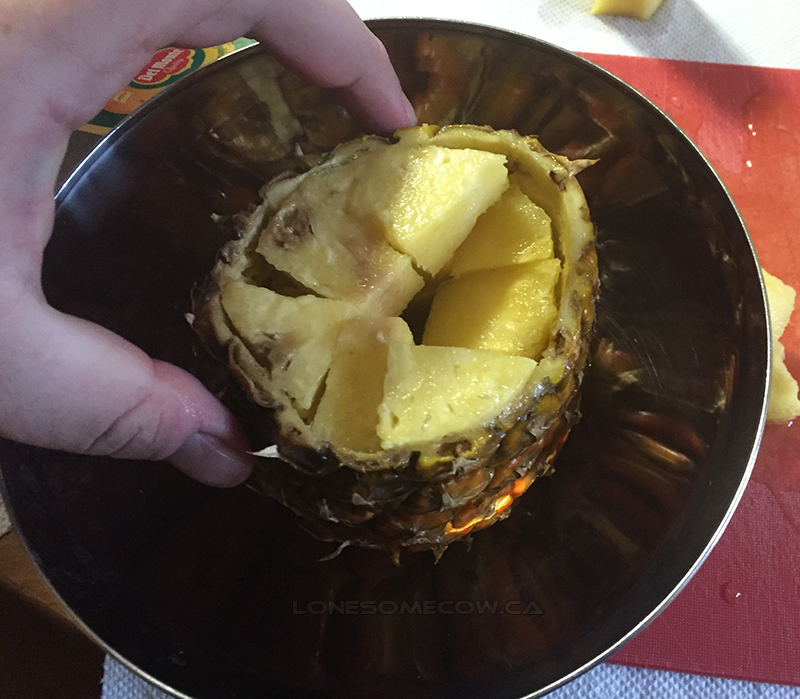 Step 3 – Cut two vertial slices in to the meat of the pineapple on either side of the core. Then spin 90 degrees and cut two more slits. 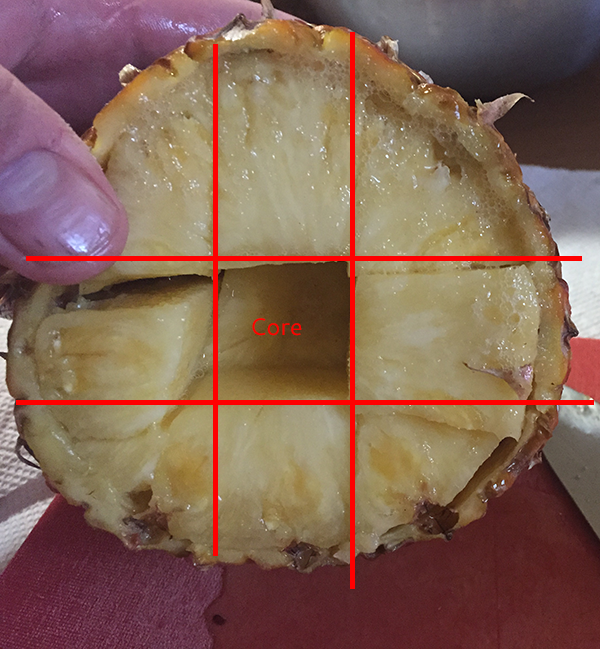 You are essentially making a tic-tac-toe board out of the pineapple and turning the core in to a nice square. NOTE – If you’ve cut all the way through the peel (like I have) the meat is going to want to slide around, make sure you have a good grip. If you haven’t, then step 3a will be to spin the pineapple around and slice around between the peel and the meat like you did in step 2. 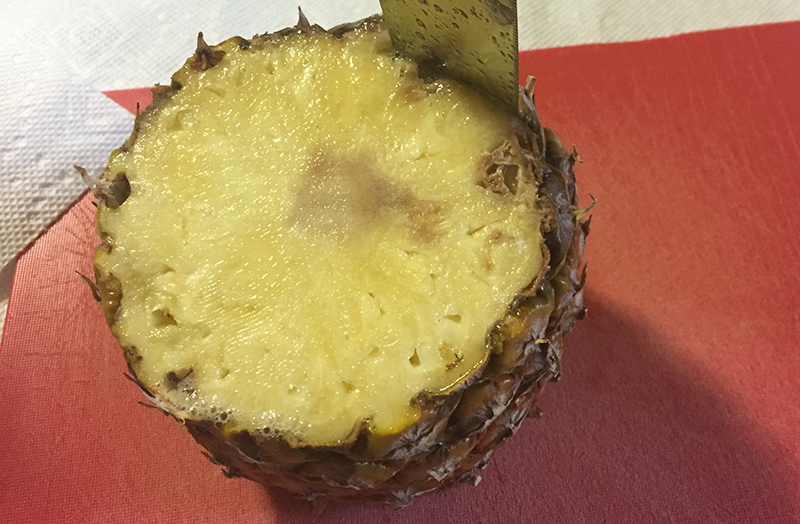 Step 4 – Push core out through center of pineapple. Discard. Step 5 – Turn the pineapple perpendicular to you so that you are looking at the peel. 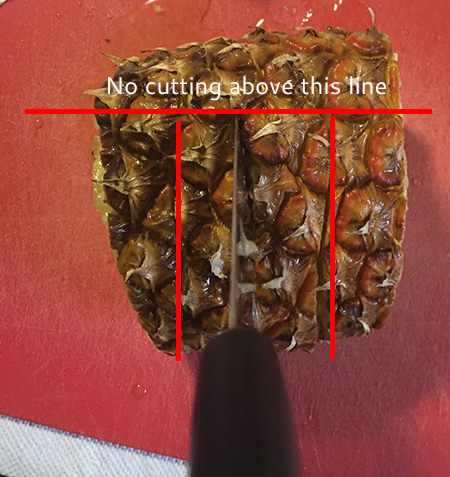 Insert your knife in to the peel at the top of the pineapple (do NOT cut through the top of the peel), then slice down to the bottom (it’s OK to cut through the bottom). Make the slices as thick or thin as you’d like. Sharper knives of course can make thinner slices. I like chunky pineapple anyway. 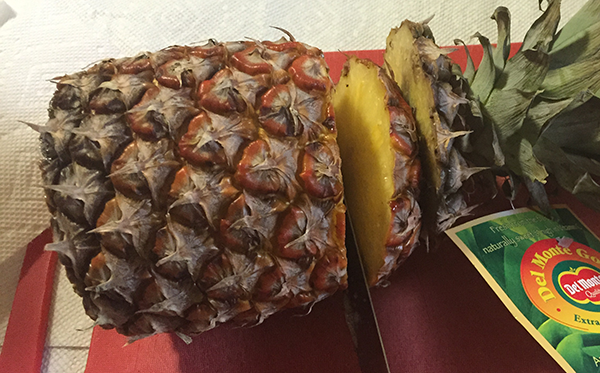 NOTE – Again the pineapple is going to want to move around, especially with the core missing, be careful. 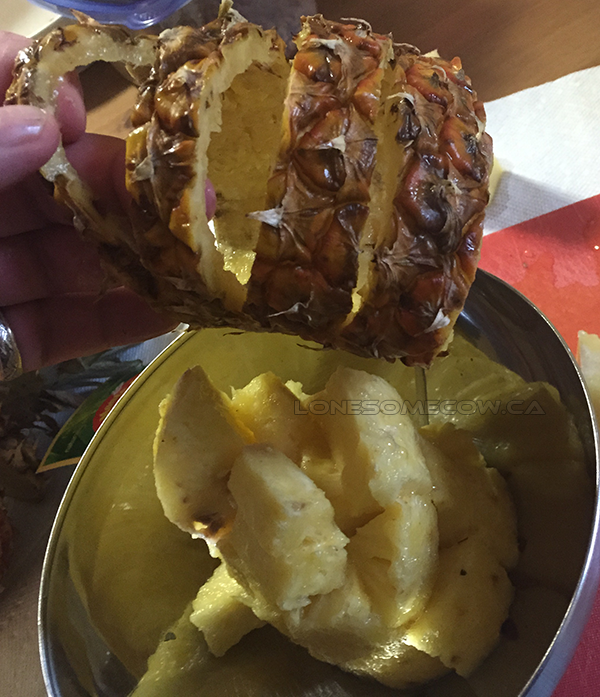 Step 6 – Life pineapple over container, and pour out contents. 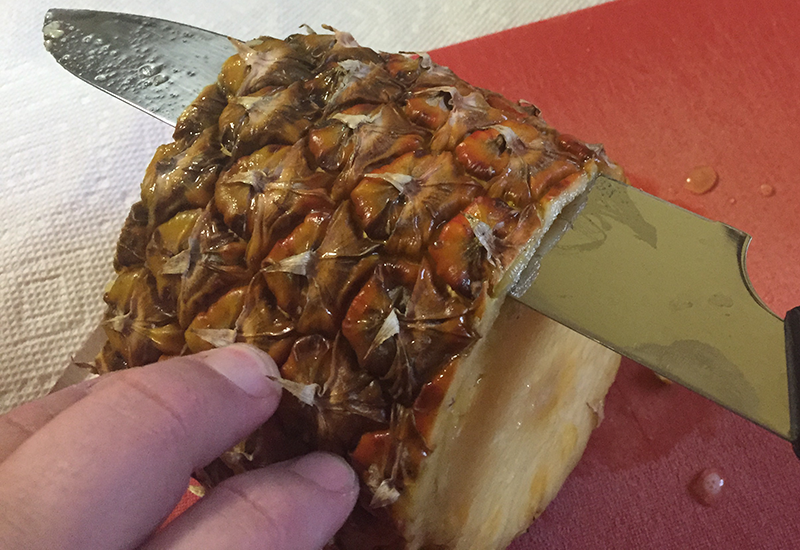 And after all that work, you should have a nice pile of cut pineapple, and one sliced open pineapple peel. Well done! Let me know how it goes for you – I’m still looking for the right kind of knife, any suggestions would be appreciated.